Posted on 09 January 2010 by Ethan Clow. So what is the deal with the Templars? Who were they? What about the Teutonic Order or the Knights Hospitallers? Are they all the same? Were (or are?) they a cult? Did they have the Holy Grail? Were they the victim of a secret alliance between the Pope and the King of France? Did they survive as the Freemasons? Historians know an awful lot about these events and groups and there really isn’t any legitimate controversy over the how, why, when and where. Nothing that would warrant huge sprawling conspiracy theories at least. So that’s why I often suspect believers of Templar myths and secret societies of Freemasons are letting their imaginations run amuck. That, or they’ve read too much Dan Brown. And I have no problem with the Da Vinci Code, it’s clearly placed in the fiction section of the book store. But Something like The Holy Blood, and The Holy Grail, on the other hand, is marketed as real history. And people believe it. Unfortunately the real history of the Knights Templar doesn’t quite measure up to the creativity of Dan Brown or Hollywood special effects. The information is out there. Easily accessible in books and articles but sadly for the conspiracy theorists, reality just isn’t as interesting. 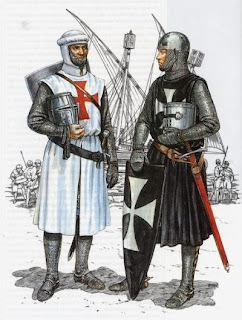 So the Templars, Teutonic Order, Hospitallers…are they all the same? No, actually. But very similar. It all dates back to the Crusades. After the Christian armies conquered Jerusalem in 1099 and temporarily routed the Muslim armies in the area, four minor kingdoms were established, sometimes called the “Crusader Kingdoms.” It was the goal of both the crusaders and Western Christendom as a whole to essentially colonize this part of the world. They wanted Christian people in Europe to immigrate to the Holy Land and set up shop there. Now that sounds dangerous. And that thought was echoed by people all over Europe. So organizations sanctioned by the Church were created to essentially guard and protect Christian settlers. These monastic orders took their names from the places they were founded in. The Knights Templars were founded in the Temple of Solomon and therefore took the name “Templars.” But they weren’t the only ones. There was also the impressively named The Knights Hospitallers of St. John. They got their origin from the hospitals they built (not medical centres but what we now call hostels.) There was also perhaps the most successful of the groups, the Teutonic Order, which had hospitals of its own. They eventually migrated to Northern Europe and set their own state. But they were cults right? Chances are, no. Most of the talk about secrets and motives and treasures probably arose from the constant competition between the orders. Each one wanted to be the most popular and famous and therefore they developed increasingly bizarre rituals and characteristics. The same way modern day fraternities compete with each other by being more exclusive and throwing the best parties. In fact, the Knights Hospitallers even claimed to have pre-Christian origins. But what about banking? Didn’t they invent banking? Well yes and no. These orders were strategically placed to make money; whether it was the income from their hospitals or the wealth taken as spoils of war. They built temples (like the one in London) and strongholds across Europe (all based on the architecture of the Temple of Solomon) which allowed them to transfer goods and supplies to the Holy Land. They were sort of like a medieval FedEx or UPS. And just like those companies, they made themselves very wealthy off it. But they had some sort of big secret right? Again that’s unlikely. Like any order they wanted to make people think they were great. They wanted young nobles to join their ranks. They wanted the patronage of Kings and Dukes. There were hardly above spreading rumours to make themselves seem more special than they were. The Templars actually suggested they were descendents of the Maccabees, why? To add to their prestige. And it did. And even if they claimed to have the Holy Grail or some other treasure – everybody claimed to have holy treasures. While I was in Europe traveling around, I visited several sites that were supposedly showing the same relic. Every Holy City claimed to have the Spear of Destiny, every King claimed to have a piece of the true cross. But they were the victim of a conspiracy between the King of France and the Pope? Yes, in the dictionary definition of the word “conspiracy.” But that has nothing to do with the Templars finding the Holy Grail or uncovering some horrible secret in the Holy Land. In fact it was hardly about anything they did. They were unfortunate victims of their own successful trading network. In the 1300′s times had changed. The Pope was no longer the supreme authority in Europe. Popes now had to compete with powerful figures like the Kings of France. Pope Boniface VIII wasn’t quite ready to accept that and issued the papal bull Unam Sanctam. That didn’t go over so well with the King of France Philip IV nor with King of England Edward I. They started taxing church lands in preparation for a war with each other. (Trivia fans, it was a long one!) Philip wasn’t done though. He seized Boniface and replaced him with a new Pope. Boniface and the papacy recovered but it was too much for the old Pope and he passed away. His successors Benedict XI and Clement V decided to take a more conciliatory approach to the King of France. After the Holy Land had been lost to the Muslims the Templars (and the other order’s) found new homes in Europe, unsure of their purpose. The Templar’s chose France as their base of operation. Victims of circumstance the Templars were in the worst place for them. Not only did they own most of King Philip’s debt, they also possessed wealth and estates across France. And importantly, they were subject to no King, only the Pope had authority over the Templars. For a power hungry monarch like Philip, this was unacceptable. 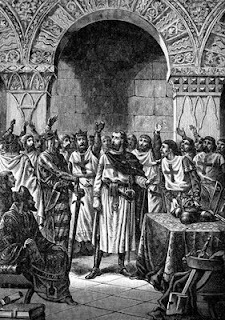 In order to repair the badly damaged relations between the Papacy and France, Clement agreed to dissolve the Templars. In 1307, Philip had many of the leaders arrested and accused them of all sorts of blasphemy and sexual deviance. Under torture most signed confessions. Afterwards a few retracted their confessions and were burned at the stake. Philip bullied the Pope into condemning the rest of the order and eventually the Pope agreed. 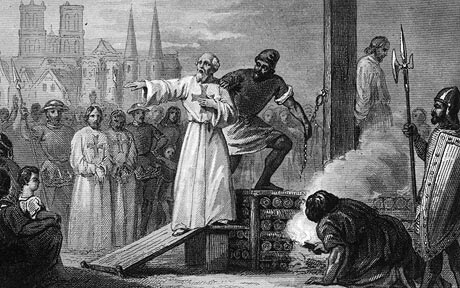 The rest of the Templars outside of France were either arrested or tried, however there were virtually no convictions outside of France. The remaining Templars either joined with the Knights Hospitallers or the Teutonic Order in Prussia and northern Europe. Others were absorbed by the militaries of other nations and Kingdoms. But that wasn’t the end was it? Nope. The Teutonic Order survived for another two hundred or so years until it was finally consumed by Poland and Prussia. But what about the Freemasons? The Templars have nothing to do with the Freemasons. The idea that the Templars survived and re-invented itself in the 1700′s is probably an invention of some creative propaganda and Dan Brown’s imagination. The truth is the Freemasons have their own unique origin that has nothing to do with the Templars. The Freemasons formed in 1717, an ideological group embracing the new Enlightenment. Groups of like-minded people (mostly men) would gather in lodges (pubs) and they would experiment with new ideas like democracy and writing constitutions. They became cultural centres, attracting philosophers, scientists and artists. People like Benjamin Franklin, Voltaire, and even Mozart. The name Freemasons should give you a hint about how and why they formed. Prior to this time period, your social status was something you were born into. If you were born to a King, you were a King. If you were born a peasant, a peasant you would remain. Similarly if you were born a wood cutter, that’s what you were forever. If you were born a butcher that’s what you stayed. And if you were born a mason (someone who builds with stone) you were stuck a mason forever. So the Freemasons were just that. Free. I’ve always been fascinated with conspiracy theories that revolve around historic events or situations. In fact, that’s one of the reasons I got involved in skepticism. As most of our readers know, my background is history. So when I hear some claim about aliens building the pyramids or human evolution being guided by little green men or my personal favourite… Antarctica used to be Atlantis…I can get pretty excited to unleash my baloney detection kit. Historic conspiracy theories or perhaps more accurately described as “pseudo-history,” always give me pause. I often suspect the person making the claim for the pseudo-history is more a victim of letting their imagination getting the better of them as opposed to being deliberately ignorant of the facts. That’s not a hard and fast rule though; Holocaust Deniers, for example, are knowingly misrepresenting the facts. But I do get frustrated when I see people taking a work of fiction and assuming its based in reality. And I’m even more frustrated when someone takes fiction and tries to pass it off as history. So what’s the next project from the folks behind the Templar myths? The Real Truth Behind the Knights Who Say Neet. From what I’ve studied and read I have always believed that the secret the Templar had was that Christ did not exist and that Christianity was developed over time to will power and control over the masses.